Divide, Col. -- Children are taught to hate and fear the wolf from the time they are toddlers. A wolf tries to eat the Three Little Pigs, another deceives Little Red Riding Hood. In movies, the full moon turns good men into evil werewolves. Such stories, which grew from the threat of predators to domestic animals, led to wolves being hunted nearly to extinction in Europe and North America. 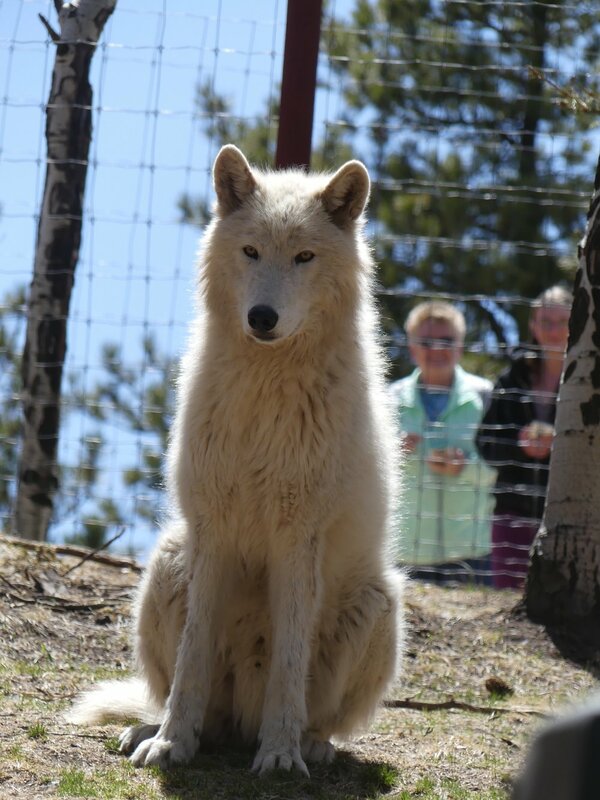 Sanctuaries, like the Colorado Wolf and Wildlife Center here in the shadow of Pike’s Peak, are about preservation, education and advocacy. They provide a home for animals that cannot be returned to the wild. Some are refugees from the illegal wild animal trade. Some come from “accidental litters” in zoos that can’t support their care. Some come from other sanctuaries, or from backyard breeders who discover too late that wolves make bad pets. Sanctuaries like this are dedicated to restoring wolves in the wild, but in practice turn them into something a lot like pets. The wolves are given human names – we hung out with Keyni and Raksha. The guides have tricks to get wolves to pose for photos with visitors who pay handsomely for the VIP tour that gets them inside the enclosures. When the wolves caught the bits of raw meat thrown to them buy the staff, it reminded me a little of the trained seals at Sea World being rewarded for their tricks. When wolves were re-introduced in Yellowstone 70 years after they had been wiped out, they brought equilibrium to an ecosystem that had suffered without them. The wolves moved along elk herds that had overgrazed parts of the park, leading to erosion and a loss of habitat and wildlife. In what scientists call a “trophic cascade,” grasses and trees came back, stabilizing the banks of rivers and streams. Birds returned, and beavers, whose dams created habitat for fish, otters and other mammals. By one tally, 350 species returned to Yellowstone after wolves were brought back into the mix. That success has encouraged the friends of wolves to push their reintroduction in other areas where they’d been hunted out of existence a century before. But wolves have enemies as well as friends. There are hunting groups, who have long lobbied to take wolves off the endangered species list. There are ranchers who see wolves as a threat to their livelihoods. They convinced state legislatures in Idaho, Montana and Wyoming to create hunting seasons for wolves. Agricultural interests have resisted efforts to re-introduce wolves to protected areas in Colorado. But the wolf wars will continue, in Congress, state legislatures and courts, because the goals of the wolves’ friends and enemies are at cross purposes and because of the contradictory nature of the beasts themselves. They are wild enough to take down elk – and cattle – several times their size, but tame enough to welcome humans into fenced sanctuaries. They can restore equilibrium to an ecosystem or ruin the bottom line for a rancher on the edge of a national park.